This Calculation Model was designed to help a user determine a broad range of Capitalization rates results for one particular property. This is extremely helpful in quickly determining whether or not your are wasting your time as it displays the best and worst case scenarios as well as everything in between. "Full Scale Spread With Internal Rate of Return Component (5 Year) Model" This Interactive Online Amortization boasts a full spreadsheet with an embedded Internal Rate of Return Calculation which looks out 5 years into the future. It is extremely flexible and allows for the user to adjust future output calculations while not interfering with today's values with features such as the dual capitalization adjustment component and more. 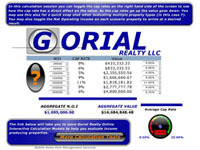 "Capitalization Rate Examples Sheet with 7 stacked adjustable N.O.I and Cap Rate" This Mobile Home Park for sale tool is found in the Mobile Home Parks 101.org section. It is designed to show a new user how cap rates have an effect on the value outcome of an income producing property. It has also been used as a stacking analysis tool for quickly stacking up to 7 Mobile Home Parks for sale on top of each other. The tool has 7 different adjustable N.O.I and user adjustable cap rates as well. This Calculation Model was designed for the Mobile Home Parks that are listed and displayed to the general public for sale which do not show pertinent information to help you make an intelligent decision. In an effort to protect the general public we have designed this model and similar models to assist in valuation of Mobile Home Parks For Sale. 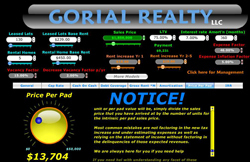 In this model it asks for "sales price" "down payment" "income" "expense" "monthly payment" & "number of sites". The algorithm based model will deliver the following outputs in real time as you type, "NOI", "ANNUAL DEBT", "CASH FLOW BEFORE TAX", "CAP RATE", "PRICE PER PAD", & "CASH ON CASH RETURN".